Everywhere you went around Austin this past week, there were people queuing up for things, Grumpy Cat, the GroupMe Grill, the Twitter party, Salt Lick BBQ. One startup fête was so packed even a founder couldn’t get in immediately. “If only all these people were daily active users,” one person at the same party quipped, on the app’s lack of popularity relative to the line outside. “The most valuable part of a trade show is seeing where the lines are,” Bing Gordon told me at KPCB’s private SXSW lunch event, which didn’t have a line on purpose. Like a Petri dish of demand, the conference was a good, if flawed, gauge of which brands could generate “buzz.” Hence every marketer and their mother flew to Texas to hawk their wares, with Oreos and Cap’n Crunch joining Uber and TaskRabbit in a four-day-long exercise to acquire unique users. The gulf between that promise and the satisfaction of that promise is driven by hype, and it creates a situation in which a company’s or person’s brand is further along in the market than their product is. Hype = potential. This works for all new entrants to a space — hype for a VC means access to better deals. See A16Z, which, at four years in, is already considered a top-tier VC despite not having a decades-long roster of returns (they do have a slick domain name, though). The trick is building a brand where people want to work with you; there’s a reason a PR person has become the best accessory for many venture folks. While hype’s network effect can help you acquire customers, if you court it you’re taking a bigger risk — you have to eventually fulfill expectations. When you go creating hype, the clock starts ticking. The pressure is on to satisfy the gap between what your brand promises and your actual product/value add. Don’t let your hype write a check that your product can’t cash, because the pressure can cause your company to lose focus. The road to the Deadpool is filled with startups whose products never lived up to the noise they made, most recently Formspring. The overhyped Color, which sold to Apple for low-digit millions, was compared to Google by Sequoia, which led its $41 million dollar funding round. But let’s not pick on whipping-boy Color; Foursquare, Zaarly, Highlight, Path and countless others, all for one reason or another, made a big headline splash and, for one reason or another, failed to live up to initial expectations and had to recalibrate along the way. Perhaps the idea that hype can harm you if you don’t manage expectations is the strategy behind Snapchat’s shunning of the media spotlight. It had no presence at SXSW despite being the social app of the moment (or at least one of them). The management team even ditched the Crunchies, where it won “Fastest Rising Startup.” The founders are as surreptitious as their products. Snapchat shows us that whether intentional or not, avoidance can at times be part of the hype strategy. And that hype is a necessary, but not sufficient, condition of success: Success will lead to hype — blog coverage, awards, etc., but hype won’t necessarily lead to success. 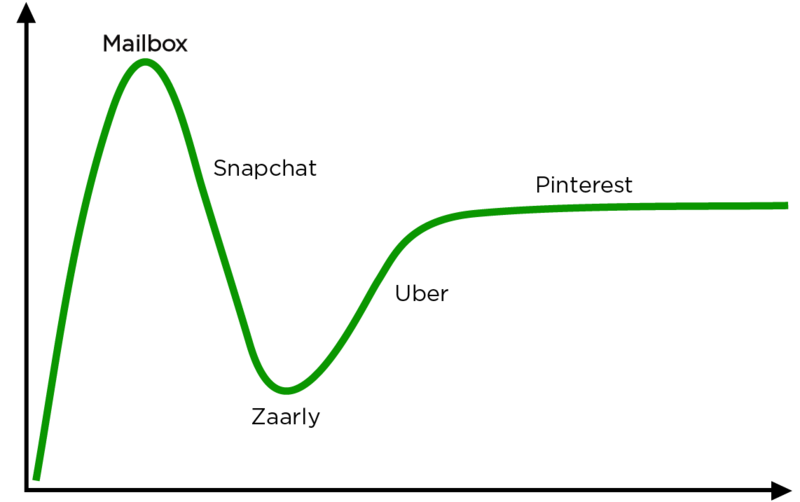 Pinterest, a startup that eschewed the tech media early on, is even further proof of this. At a $2.5 billion valuation, the company has convinced investors that it will eventually have a commerce ability and will eventually bring in meaningful revenue. Pinterest’s hype is writing a big check. But many believe that its product will make good on its vow, and that is where the magic happens. As Foursquare struggles to live up to its hype, Mailbox, an app that has over half a million people still lined up just for the privilege of using it, cashed in on what was perhaps the most lucrative product relaunch in tech news history — getting Dropbox to place a nine-figure bet on the hope that the app will one day be able to expertly handle email attachments. It doesn’t at the moment. One could argue, as Gartner does, that the tech industry on a macro level is an example of hype, promising that emerging technologies will actually create the future world we want to live in.